1.Floral Maxi Dress – 2.Slippers – 3. Ruffle Sleeve Top – 4.Straight Leg Jeans – 5.Blush Pink Bag – 6. 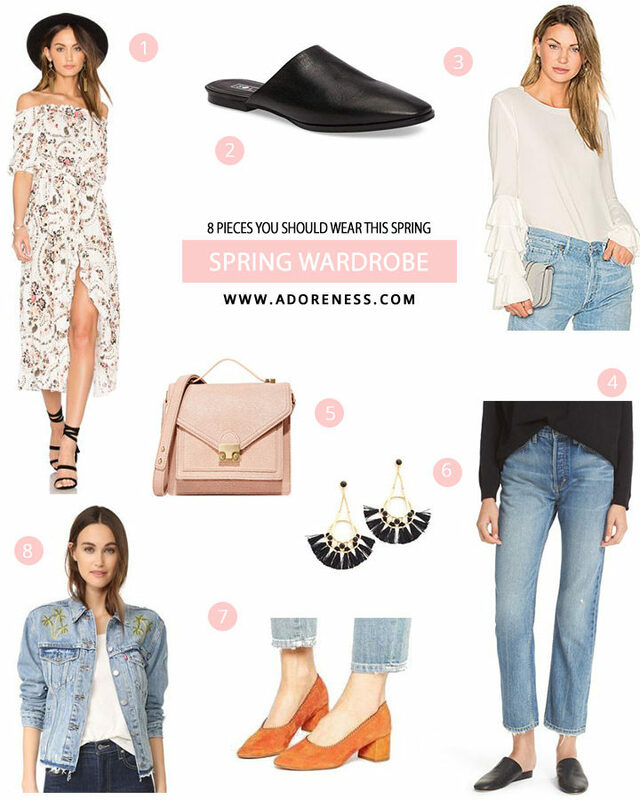 Statement Earrings – 7.Block Heels – 8.Denim Jacket. Floral dress: spring is all about flowers, so there is nothing that suits better the season than a floral dress. A maxi version can easily be dressed up or down according to occasion and weather. It’ll go pretty well with sandals during your spring break or with a light jacket and a hat for colder days . Slippers: these are a sensation among the fashionistas, but they quickly became popular due to its cool and chic vibe. They are so easy and comfy to wear that I don’t see any reasons why you shouldn’t try too. Statement Sleeve: this might sound a bit repetitive as we’ve been talking about statement sleeves since last spring – I particularly love it! But there is something about a ruffled sleeve that is hard to resist! 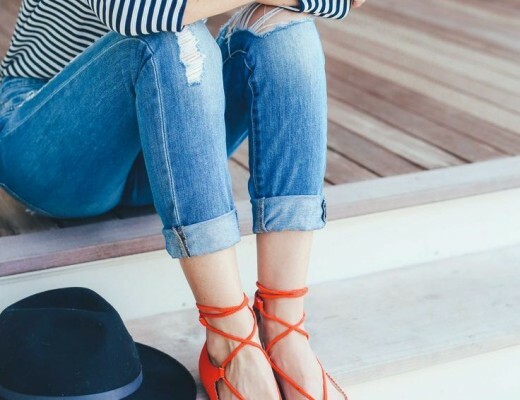 Straight leg jeans: I can’t wait to drop the skinny jeans + booties combo for the straight leg + slippers! It’s finally time to show off some skin and invest on lighter jeans styles. I’m particularly looking for a nice one with a frayed hem or distressed details. Blush colors: although I could live in black, white, beige and gray, I do feel like adding a pop of color as the season changes. Blush colors are perfect as they still lay on the neutral zone, but can brighten up your look. Adding an accessory in these tonos such as a crossbody bag is a great way to try it out. Statement earrings: This is quite a challenge for a minimalist kind of person like me, but I’ve been dying to try statement earrings lately. This is definitely something I will wear this spring! Block Heel: who knew pumps could be so cute and comfy? This ideal heel goes with almost every occasion I can think of! Definitely worth the investment for me, specially the low heeled one! I’m sure I can wear it from the office to the happy hour . Denim jacket: this has always been part of our wardrobe in any season, but denim jackets are definitely a spring must wear right? If you are willing to try something different and cool, an embroidered piece is a good call!